Yesenia Herrera is a 27 year old woman who is completely dependent on dialysis and who dreams of a kidney transplant to transform her life. Beautiful, free-spirited Yesenia has been living on dialysis for five years, after enduring ten surgeries including one that nearly ended her life. 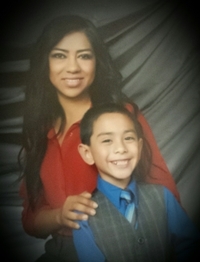 She is a strong and caring sister, mother and daughter, who desperately wants to hold on to life for her seven year old son (pictured with her on this page.) He is the reason she will continue with dialysis and go through a transplant. Yesenia is thrilled that a family member will be donating a kidney to her but she needs our help with the medical expenses. Yesenia grew up in Landers, CA, a place that she loves dearly. There she spent most of her teenage years, spending evenings on roof tops to watch the beautiful sunsets. She graduated from Copper Mountain College, never allowing her kidney disease to become an obstacle to pursuing her goals. Yesenia has many aspirations in life, including studying to get her real estate license but her greatest dream by far is to be able to live long enough to watch her son graduate from high school and become an adult. We can help make this happen! Funding this lifesaving transplant is a monumental task, as there will be many medical expenses that will not be covered by Yesenia’s insurance. This is why we ask for your help, because these expenses are adding up to more than the family can handle on their own. Thank you for your prayers, support and generosity. Together we can help give Yesenia a happy healthier life. On behalf of Yesenia and her family, we thank you in advance for your kind consideration.